Ok, now I am officially behind. As I write this it’s late on the night of Thursday 15 November. I am exactly half way through the month but nowhere near the half way mark in my word count. 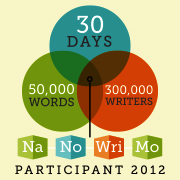 The very helpful calculators on the NaNoWriMo website tell me that at my current rate I will finish on December 12 or else I can write 2,023 words a day to catch up and finish on November 30. This is starting to get overwhelming. I was at Maleny over the weekend and I thought that would be the perfect chance to catch up on my word count. Quiet, no distractions, no excuses to focus on other things, it was perfect. I did get a bit of writing done early in the morning but then eating and drinking got in the way and worst of all, I started reading a book I couldn’t put down. Self-discipline fail. Because a photo of my computer wouldn't be very interesting. What I have found out though, is that writing a novel based on personal experiences can be a double edged sword. Following the adage ‘write what you know’, I am basing my ‘novel’ on my own stories. However, I think I am writing too closely to those experiences and as a result I am not being sufficiently creative. I am not bending my words enough, I am not twisting people and creating thrilling conflict. It’s dull, I’m going to be honest with you. It is also more difficult to write. I feel stifled by my own narrative choices. Said she, pretending to know what she was talking about. If I was ever foolish enough to attempt this project again, I would pick one experience, one feeling of my own and build from that. I would give myself more room to move. It doesn't matter how early I set my alarm clock for I still won't start writing until 5:30 at the earliest. I will most feel like writing between 9 and 11 am, when I am at work. That's pretty damn annoying. Gin does not make me sleepy and is therefore a good choice of late night writing alcoholic stimulant. Camel meat might start out smelling like beef but quickly changes to a very rich and pungent aroma all of its own. It is also a long cook. Not everything is about writing.